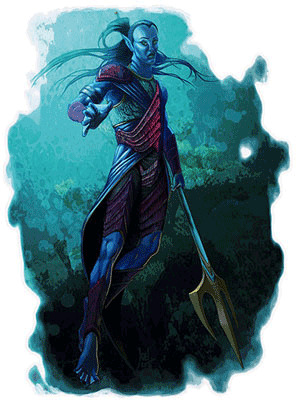 Undines are humans whose ancestry includes elemental beings of water, such as marids. This connection with the Plane of Water is most noticeably manifested in their coloration, which tends to mimic that of lakes or oceans—all undines have limpid, blue eyes, and their skin and hair can range from paleblue-white to the deep blue or green of the sea. +2 Dexterity, +2 Wisdom, –2 Strength: Undines are both perceptive and agile, but tend to adapt rather than match force with force. Speed: Undines have a swim speed of 30 feet. Darkvision: Undines can see in the dark up to 60 feet. Elemental Resistance: Undines have cold resistance 5. Elemental Affinity: Undine sorcerers with the elemental (water) bloodline treat their Charisma score as 2 points higher for all sorcerer class abilities. Undine clerics with the Water domain cast their Water domain powers and spells at +1 caster level. Languages: Undines begin play speaking Common and Aquan. Undines with high Intelligence scores can choose any of the following bonus languages: Auran, Dwarven, Elven, Gnome, Halfling, Ignan, and Terran.